Twistfix constantly strive to extend our product range in order to provide as many innovative solutions as possible to the varying problems encountered in maintaining a building. A particular problem with many buildings is that of heat-loss. The wasted energy represents wasted money and the negative impact on the environment is something that needs to be reduced. Properly insulating and waterproofing a property is obviously essential. Once this has been carried out however, there are still many ways to improve the efficiency of the heating system. Most homes are now centrally heated; hot water from the main boiler is piped around to radiators located around the property. This is quite an efficient method of heating but can be made even more so with the installation of Twistfix radiator reflector panels, newly added to our wide range of damp proofing, masonry crack repair and mould removal products. Manufactured in high-quality, durable PVC, the heat-reflective panels have a highly reflective coating, metallised with aluminium. They reflect infra-red heat back into the radiator so that water returning to the boiler is hotter, meaning it is triggered less often. Ridged panels trap insulating air pockets between the wall and radiator which reduces the amount of heat lost through the wall; this is the most common inefficiency of radiators and our reflective panels admirably solve this problem. These multi-ridged panels also stimulate convection currents, improving the efficiency of heat circulation and increasing the comfort level of the room. Twistfix radiator reflectors come in packs of 5, 10, 15 or 20 panels and include a 25 metre roll of tape, sufficient to fix five panels. 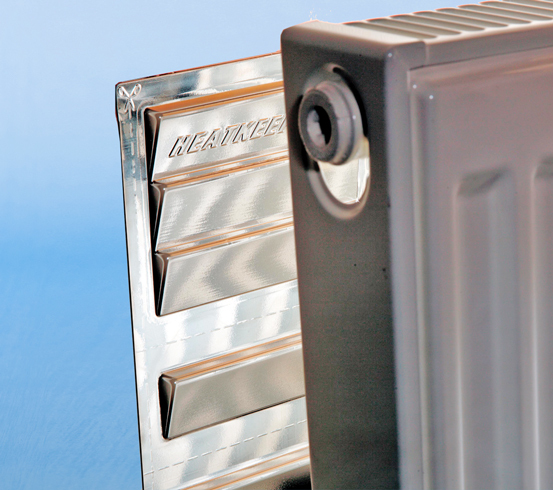 The average-sized radiator will require 2 to 2.5 panels. Full, clear instructions are provided and our dedicated team are always on hand to offer advice and assistance with this and any of our products. When fitted to all radiators in the home, reflector panels can save 20% on heating costs, meaning that the product pays for itself in energy savings in less than one heating season. These average expected savings are approved by Ofgem under the CERT program (Carbon Emissions Reduction Target). Installing these innovative panels is both cost-effective and good for the environment. These two factors combined with the peace of mind that comes from dealing with a professional, expert company like Twistfix mean that installing these reflective radiator panels is more necessity than luxury. If you require more information or advice on any of our products, please do not hesitate to contact us. For more information concerning radiator reflector panels please contact us on 0845 123 6007 or email info@twistfix.co.uk.